In a video taunting us, our ears loudly ringing. “Tough cookies for them! There’s nothing they can do! They’ll complain and they’ll cry for a week or two! Then subscribers will go back to what they always do! “They’ll pay up the nose if the ISPs demand! Companies will pay lots of cash for the fast lane of broadband! People will see it first, others can just go to hell! “Verizon likes FOX News? That’s what subscribers get! “Innovation? Bah! Creativity? Boo hoo! 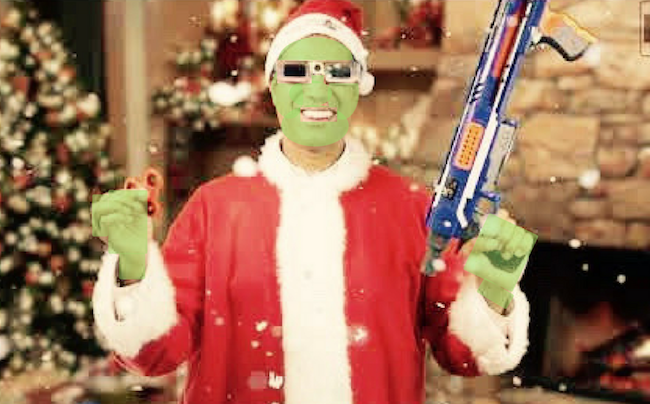 So Grinchy Pai did as he vowed long ago. He killed net neutrality with one swift blow. But then Grinchy Pai heard a sound that started in low. And as Grinchy Pai listened, it started to grow. Came together to share their power and vision. Their next job, they realized, was to put on their boots. From 25/3 to 10/1, which just didn’t meet America’s needs. He wanted satellite and mobile to be listed as broadband. American's said, "No way! This is getting out of hand!" They met in coffeehouses, shared beer, and joined forces. Locals harnessed the power of ten million horses. Local folks realized they were powerfuls, not punies. They won elections at the federal, state, and local level. And tossed out that Grinchy Pai, the mean old devil. They reversed his bad policies every last one. They passed better ideas to fix the harm that he’d done. The ISPs were surprised, they expected more congeniality. After all, it was only network neutrality. Decided net neutrality would be for the best. Went on to prosper with benefits that last. States saw the wisdom and changed bad laws. They took away Florida’s, they took away Utah’s. Net neutrality was restored; Americans shared a collective hug. And a sad little man cried into his giant Reeses mug. The Community Broadband Networks Team at ILSR wish you Happy Holidays and we look forward to continuing our work in 2018! Thank you for all your support!